THE MOST RELIABLE AND DURABLE RABBIT STYLE LEVER CORKSCREW ON THE MARKET has won the hearts of wine lovers all over the world! The simple, effortless operation and the is functional, easy and durable. You'll be shocked at how easily you can pull corks from your favorite wine bottles......for any holiday or occasion. A SPECIAL BOTTLE OF WINE DESERVES A SPECIAL TOOL TO OPEN IT - The moment of anticipation when friends and family gather and wait for the bottle to open......wine lovers everywhere will love this perfect gift to capture that perfect moment! EFFORTLESS, ERGONOMIC AND EFFICIENT - A single lever does all of the work and replaces traditional clumsy waiters corkscrews. PREMIUM CRAFTED SLEEK DESIGN FOR HIGH END APPLICATIONS IN VISIBLE LOCATIONS - High End Luxury finish and smooth operation allows you to uncork a bottle up to 10 TIMES FASTER than traditional openers. THE BEST GIFT SET FOR ANY OCCASION - Family, Friends and Acquaintances will love this Specialty Gift Kit for Christmas, Mothers Day, Fathers Day, Anniversaries, Retirement, Weddings, House Warming, Baby Showers, Diaper Parties and any other reason to enjoy a great event. SPECIAL BONUS GIFTS INCLUDED - Free durable, high quality foil cutter and premium velvet magnetic box included with the best wine opener on the market!. CLICK "ADD TO CART" NOW - Start saving time and money and let the celebration begin! FULLY SUPPORTED SATISFACTION GUARANTEE!!!! 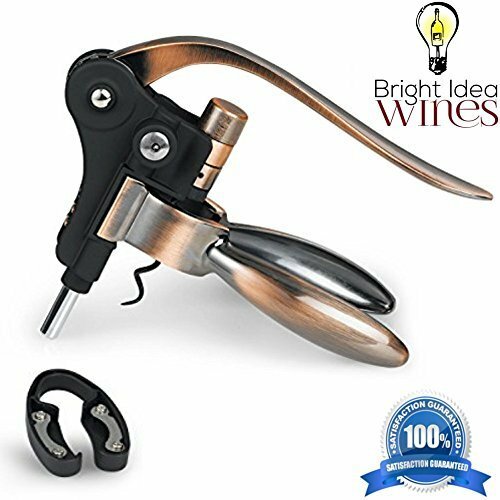 - If you're not completely happy with our BRIGHT IDEA WINES ORIGINAL opener, you can always return it for a full and complete refund.....no questions asked! If you have any questions about this product by Bright Idea Wines, contact us by completing and submitting the form below. If you are looking for a specif part number, please include it with your message.